Gastown is Vancouver’s oldest neighbourhood and a gathering place for stylish locals. Cobblestone streets and Victorian architecture are home to a thriving fashion scene, impeccably curated décor boutiques, one-of-a-kind galleries and some of the best culinary fare in the city. The neighbourhood is easily explored on foot, giving visitors an opportunity to browse independent shops and enjoy afternoons on fantastic patios. Gastown is also great for budding photographers, offering both popular subjects like the Steam Clock and Hotel Europe to the off-the-beaten path bounty that can be found within the area’s character rich buildings, mews and alleys. 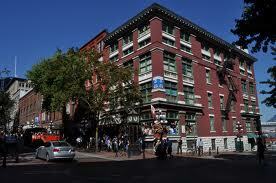 Established around the area’s first tavern, Gastown is the heart of Vancouver. It was designated a National Historic Site in 2009, and offers a saw tooth skyline that dates back to Victorian times. Gastown is central to Vancouver’s position as one of the most cosmopolitan cities in the world, providing a rich, textured backdrop for the neighbourhoods vanguard group of entrepreneurs. For more information on where to shop, what to eat and when to visit, go to www.gastown.org. – Take the 007 Nanaimo Station from the corner of Granville and Georgia heading Northbound and get off at Cordova and Homer. – From Vancouver City Centre Station (Granville, between Georgia and Robson), go to the platform marked “Canada Line to Waterfront”, and take the Canada Line Skytrain heading Northbound to Waterfront Station. – From Burrard Station (Burrard and Dunsmuir), go to the platform marked “Waterfront via Columbia”, and take the Millenium line skytrain to Waterfront Station. – From Burrard Station (Burrard and Dunsmuir), go to the platform marked “To Waterfront”, and take the Expo line skytrain to Waterfront Station. During the day, Gastown is buzzing with tourists admiring the historic landmarks, artists and design retailers going to work, and locals taking advantage of the unique mix of shops. At night, the neighbourhood transforms into a nightlife hub with a mix of pubs, lounges and clubs to choose from. 350 Cordova Street – Popular boutique store carrying men’s and women’s fashions by local designers, in addition to up-and-coming international lines. Brands include LaCoste, Isabelle Dunlop, Seven, Addidas and more. 354 Water Street – Original fashions offered in limited runs and made of all-natural fabrics. Be sure to check out their sister store next door, Two of a Few. 54 Alexander Street – An amusing and fun mishmash of clothing, accessories, housewares and more! Always a fun shopping experience. 7 Gaoler’s Mews – Tucked away in Gastown’s historic Blood Alley, Haven is truly one of the coolest men’s shops in the city. Hard-to-find exclusive labels such as Deluxe Japan, Sag Tokyo, Comme des Garcons, Original Noir and more. 38 Water Street – Specializing in well-designed women’s fashions crafted from the most luxurious fabrics. 273 Columbia Street – This gallery features Latin American art in an inviting space. 65 Water Street – Specializing in stylish shoes and boots for men and women. Fluevog Shoes are made from eco-friendly products in factories that employ old-school cobbling techniques. 310 Cordova Street – Long established quality vintage consignment store. Carrying vintage and contemporary fashions and an excellent selection of signed costume jewelry. Their stock is rotated on a regular and seasonal basis. 239 Abbott Street – Hip hop, sneaker and skateboard lifestyle store with brands such as Nike TZ, G-Shock, BBC, Adidas Consortium and more. They also host events and feature art installations by influential and renowned artists. 350 Water Street – Lifestyle concept store based on and in downtown New York. Fashion that is artistic, creative, original and urban. 231 Abbott Street – Designer urban fashions with a true hip hop feel. Brands include Jordan VIII Retro, Artful Dodger, Kilo Goods and more! 303 Cordova Street – If you are looking for that perfect pair of jeans, look no further. Dutil literally has stacks and stacks of jeans to choose from. Designer brands include Rock & Republic, True Religion, Capital E by Levis and much more. 302 Cordova Street – Carrying Italian designer fashions for men and women at discounted prices. Affordable and stylish! 207 Abbott Street – Clothing gallery specializing in high quality Italian, Scandinavian and North American fashions. The store has a loft-feel with brick walls covered in beautiful art. A boutique shopping experience with a focus on modern urban lifestyle. 50 Water Street – The latest in contemporary furniture and home decor can be found at Inform. Long-established and committed to providing the best in quality and design excellence. 151 Water Street – Contemporary furniture and home decor offered at a fraction of high-end modern design stores. Orling & Wu 28 Water Street – Featuring an eclectic range of furniture and home decor that is glamourous yet relaxed in style. 320 Cordova Street – Quality home decor that is classic in design and will stand the test of time. Perfect for simple, everyday living. 18 Water Street – Contemporary furniture store featuring a collection of modern designer furniture. They offer a Customization Program with experienced interior designers to help you find the perfect solution for your home. 318 Homer – A fun little button store that has buttons from all around the world. 364 Water Street – Popular dance club/lounge that features 80’s classics, soul, house, hip hop, r&b and reggae. 99 Powell Street – Experience a mix of good music, entertainment, art and cuisine in this trendy Gastown lounge. 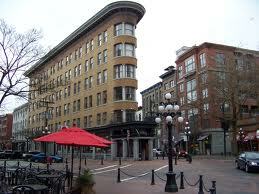 66 Water Street – Popular Gastown nightclub that regularly features renowned DJs from around the world. 7 Alexander Street – Featuring two dance floors with killer sound systems and some of the city’s finest DJ talent. 92 Water Street – Long-established and recently revamped pub featuring the city’s largest HD projection screen, pool tables, darts, fooseball, video games and more. Go early on weekends to ensure entry on their DJ fueled nights. 50 Cordova Street – Vancouver’s only country bar – a great place to meet with friends over a pint and even some dancing! 216 Carrall Street Popular Irish Pub with the college crowd. Featuring quality Irish food and entertainment with a high-energy environment on weekends.